grounding assembly, as demonstrated by tests per clause 12.3 of ASTM F855-97e1 or per clause 6.6 of IEC 61230 (1993-09). A master ground is a portable device designed to short circuit and connect (bond) a de-energized circuit or piece of equipment, or both, to a ground electrode. It is normally located remote from, and on both sides of, the immediate work site, and primarily used to provide safety for personnel during construction, reconstruction, or maintenance operations. A personal ground is a portable device designed to connect (bond) a de-energized conductor or piece of equipment, or both, to a ground electrode. 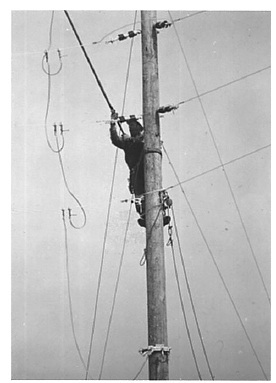 It is distinguished from a master ground in that it is utilized at the immediate site when work is to be performed on a conductor or piece of equipment that could accidentally become energized. A structure base ground is a portable device designed and used to connect (bond) equipment to a metal structure. It is primarily used to provide safety for personnel during construction, reconstruction, or maintenance operations. A running ground is a portable device designed to connect a moving conductor or wire rope, or both, to a ground electrode. 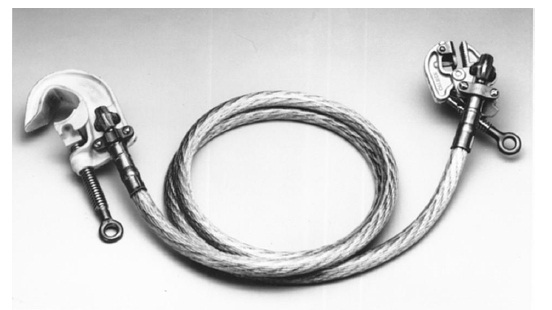 This device is normally placed on the conductor or wire rope adjacent to the pulling and tensioning equipment located at either end of a sag section. It is primarily used to provide safety for personnel during construction or reconstruction operations. where electrical grounds are required. A traveler with a ground is usually sensitive to direction pull. Care shall be exercised in hanging the traveler. Usually the ground is to the pulling end. It shall be connected with temporary grounding, or to some conductive medium that is at ground potential. Care shall be taken in regard to the length of the grounding cable and the anchor point. 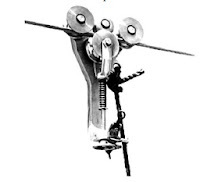 Too short of a cable may pull with block movement, and too long of a cable may become entangled with the sheaves and rollers, thus destroying the cable and conductor. The traveler ground should have a suitable grounding stud located in an accessible position to enable placing and removing the ground clamps, with a ground stick when necessary. The traveler ground will also help protect the sheave linings. A ground grid is a system of interconnected bare conductors, metallic surface mats, and/or grating, arranged in a pattern over a specified area. Normally, it is bonded to ground rods driven around and within its perimeter to increase its grounding capabilities and provide convenient connection points for grounding devices. potential differences within its perimeter to safe levels in case of high currents that could flow if the circuit being worked became energized for any reason or if an adjacent energized circuit faulted. When used, these grids are employed at pull, tension, and splice sites. A ground rod is a rod that is driven into the ground to serve as a ground terminal, such as a copper-clad rod, solid copper rod, galvanized iron rod, or galvanized iron pipe. 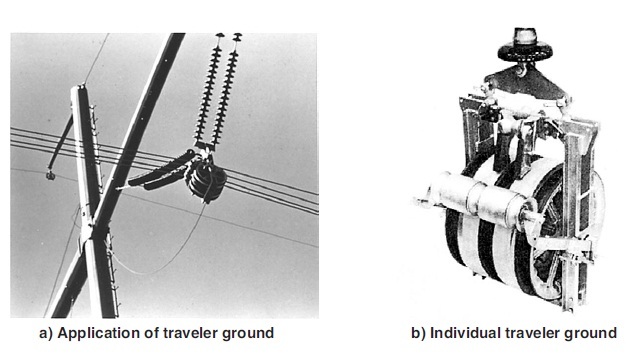 The ground rod is commonly used during conductor stringing operations to provide a means of obtaining a ground electrode using portable grounding devices. If a ground rod is free of paint, grease, and oil, the contact resistance between the rod and the earth is negligible. Therefore, the main resistance is contained in the body of earth immediately surrounding the ground rod. The shell immediately surrounding the electrode has the smallest cross sectional area (highest resistance); as the distance from the electrode is increased, each shell is correspondingly larger in cross section (lower resistance). Therefore, when a current flows, the voltage drop next to the ground rod is very high and decreases as it moves out from the rod.